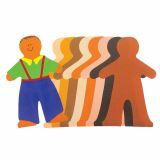 This cut-out shape is great for “people crafts”, school and art projects, teaching aids, locker tags, etc. 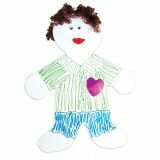 This cut-out shape is great for “people crafts”, school and art projects, teaching aids, locker tags, etc. 16" high. 25 pieces. 60 lb. text. 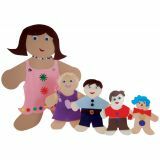 Culturally Diverse Tag People Kit, 7"
Everything you need in a complete kit to decorate 24 people shapes with clothes, hair, and eyes. 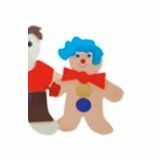 7" Set Includes: Tag People with curly hair and gummed paper for clothes and wiggle eyes.16" Set Includes: Tag People with curly hair, velour paper and clothes, buttons, and wiggle eyes. Approximately 4" x 5" in assorted primary colors. 36 per package. Cute little hands are great for name tags and desk markers. 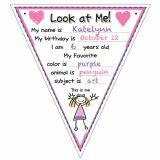 Add fingerprints for a unique and personalized project. 8 rich skin tones. 3 ", 35 sheets. 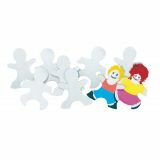 Two interlocking kid shapes cut from sturdy corrugated card. Add hair and clothes. 4 " x 6". Includes idea guide. 24 per package. 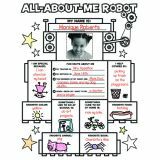 11" x 12" printed on heavy text weight stock that can accept a variety of mediums, Micro-perforated for neat and easy tear out. Holes provided to easily string together or hand with clothes pins for a banner. Space saving design. 36 count. 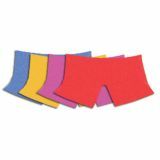 Shapes are made of acid free text-weight Mighty Brights paper in a variety of colors. 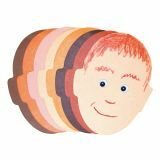 Fit the 16" ME kid cutouts. 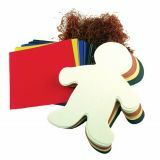 This cut-out shape is great for “people crafts”, school and art projects, teaching aids, locker tags, etc. 16" high. 20 pieces. 80 lb. tag. 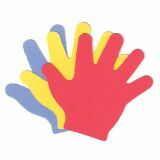 Family card stock shapes in culturally diverse colors. Pack of 24.